With regular-season meets complete, the No. 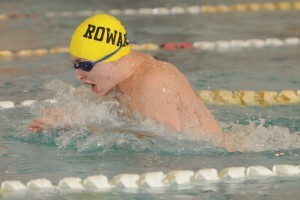 13 ranked Rowan men’s swimming and diving team prepares to battle for first place at the Metropolitan Championships in New Brunswick beginning Friday, Feb. 19. Last year, the brown and gold finished second of 17 teams with 1,286 points in the three-day event. It was the best team-placing for Rowan since the 2006-’07 season. 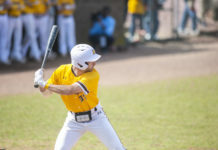 Among the many programs in the Metropolitan Championships again this season, Rowan’s biggest competition will be the two teams they faced just a week ago: University of Bridgeport and The College of New Jersey. Rowan dropped the unofficial New Jersey Athletic Conference Championship to TCNJ, 162-136 on Friday, Jan. 29, before defeating Bridgeport the next day, 104.5-98.5. According to the Profs’ captains, the Lions will pose the greatest challenge despite the talent level of some of the other squads. For Rowan, the history with TCNJ motivates the entire team. Going into the final Metropolitan Championships of his career, Coe emphasized the need for a little rest before the meet. 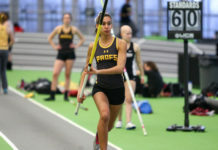 Falling back from training was an important factor in the Profs securing first place at the Lions’ Invitational, according to members of the team. The guys had a two-week gap before that event and head coach Brad Bowser managed rest and training well. The team also believes that their desire and hunger will push them to victory at the Metropolitan Championships. “We’re a better team this year and we’ve been training hard but it all comes down to wanting it more than the others,” Bowser said. Novak, who holds team-best times in the 50 and 100 freestyles this season, will be participating in his third championship event. The two captains, Novak and Coe, look to lead the team with confidence, guiding the anxious underclassmen swimmers past the nerves that come with the scale of the meet. Novak recalled a moment from last year’s meet with a former freshman. Previous articleIf Rowan had a Tinder what would its biography say? Would you swipe right or left?